Help raise awareness for BVVL/RTD by purchasing an exclusive t-shirt showing your support. Each letter of the word, "Hope" is a different drawing by Alex Fitzgerald, who has this disease. We thank you for your support! WILL ONLY BE AVAILABLE UNTIL MAY 24TH! "BVVL is a rare, progressive, neurodegenerative motor neuron disorder that specifically includes palsies (paralysis) of the cranial nerves, and is sometimes referred to as “bulbar palsy.” The name Brown-Vialetto-Van Laere comes from physicians and researchers who described some of the first reported cases (Brown, 1894; Vialetto, 1936; and Van Laere, 1966), all of which also include sensorineural hearing loss. Though sensorineural hearing loss is a primary component of the syndrome, it may not be discovered until late in children due to the mildness of the hearing loss or the more obvious symptoms that manifest first. Progressive bulbar palsy without hearing loss is referred to as Fazio-Londe syndrome." "Alex was born in March 1997 a healthy, happy baby boy. For the first year of his life he thrived and developed normally with no apparent health problems. All that changed shortly after his 15 month vaccinations when Alex developed a sudden onset of nystagmus (wiggly eyes.) Fearing a brain tumor, Alex was sent for an emergency CT scan. To our relief, the CT scan came back completely normal, however the nystagmus persisted. The following week Alex was sent to an ophthalmologist who discovered mildly pale optic nerves. Within one month, Alex’s optic nerves went from slightly pale to severely pale, indicating optic atrophy and profound visual impairment. Shortly after the age of three, Alex slowly began losing his hearing as well, and by the time he turned six was severely deaf and was given a cochlear implant. Subsequently, he lost the ability to walk and eventually most of the use of his arms and hands. He developed rapidly progressive scoliosis which was so severe he required surgery at age 12, permanently stunting his growth. We also started noting severe anemia, particularly following times of stress. Despite the progression of his neurological symptoms, Alex remained healthy overall. Over the years, we took Alex to numerous neurologists, ophthalmologists, geneticists and metabolic specialists at multiple hospitals in and around the Washington-Baltimore region. No one could determine what was happening to Alex and every single test came back normal. Doctors had never seen anything like Alex’s disorder before. Potential diagnoses were everything from mitochondrial disease to adrenoleukodystrophy to some kind of food allergy, with many doctors speculating that Alex had his very own unique disease. By the time he was 16 years old, Alex had seen over fifty specialists in the top hospitals in the world, in areas spanning from neurology to immunology. Not one of these great institutions could pin down what could be causing these developing symptoms in Alex. After a time, it seemed the doctors started giving up, as no new tests were becoming available that we hadn’t already done. The only bright spot in this decline was the fact that this relentless disease was sparing Alex’s mind. His cognitive abilities remained above average and he was able to stay in a regular school setting with grade-level classes with a lot of physical supports. The downside was that Alex was fully aware of his declining body, and began begging for an answer himself. 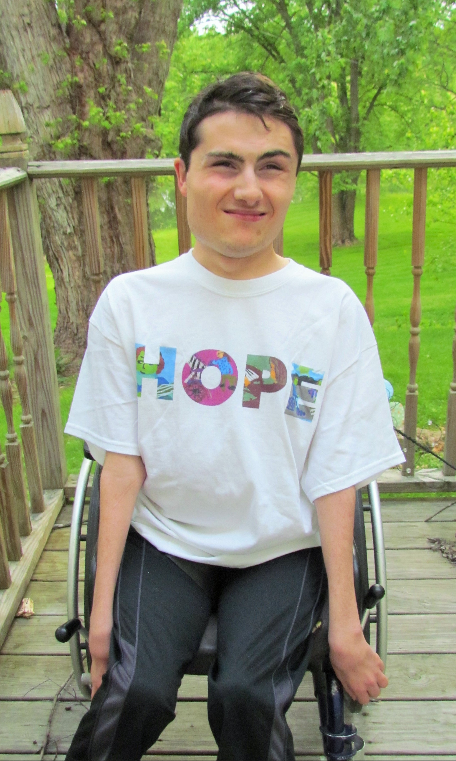 In the Spring of 2013, Alex was admitted into the NIH Undiagnosed Diseases Program, our final hope for an answer. After numerous tests taken during April 2013 turned-up nothing, it wasn’t until November 2014 that NIH finally sent his blood for exome testing and we learned the truth once and for all. The exome showed that Alex has mutations in the SLC52A2 gene which results in Brown-Vialetto-Van Laere Syndrome, a disease so rare less than 100 people worldwide have been diagnosed. After seventeen years of watching Alex slowly decline, we finally had an answer as to why. We also discovered that this disorder had a treatment that might help, as there had been previous cases where the administration of high doses of riboflavin resulted in improvement. And while it was bittersweet to learn we might have spared Alex a lot of suffering had we been handed this diagnosis much earlier, we were nonetheless relieved to have an answer and some hope for improvement. Alex is currently a junior in high school where he maintains a 3.8 GPA. He is a math whiz and an artist and participates in drama and his school’s earth organization. Having lost most of the function in his hands, he currently draws with his nose using a touch screen computer and sells his artwork online. He plans to go to college to study math and by all accounts, has a bright future ahead of him."